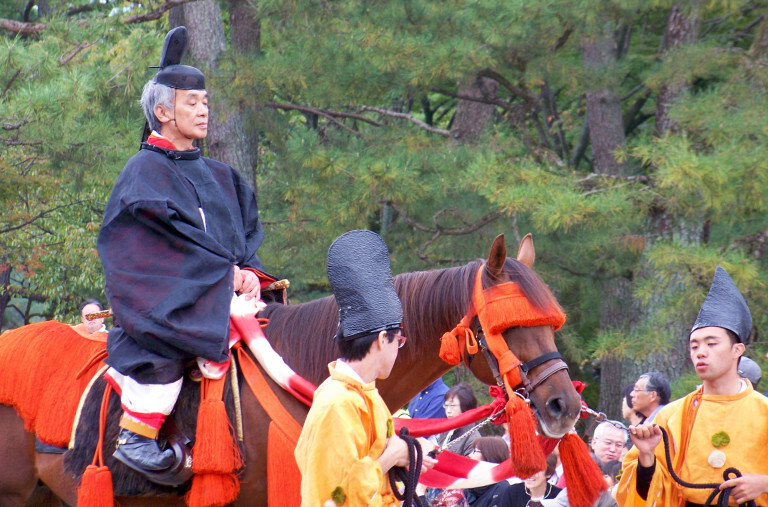 Why you should attend Jidai Matsuri- one of Kyoto's 3 great festivals! 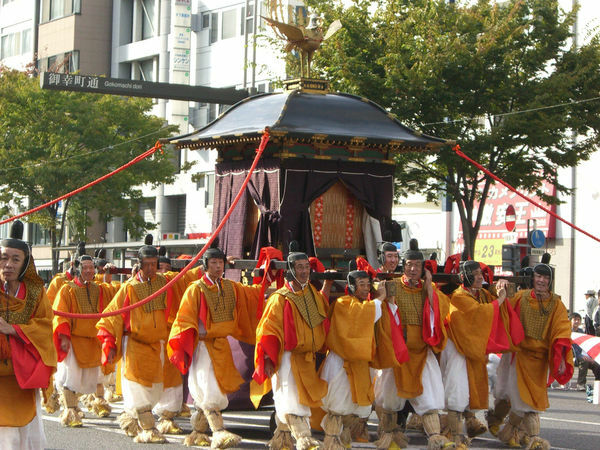 The Jidai Matsuri is one of Kyoto's renowned three great festivals takes place on October 22 annually (please note that the festival will be postponed to the 23rd in the event it rains on the 22nd). The lively festival is celebrated by locals of all ages, adorning authentic traditional costumes representing various periods, historical figures and characters in Japanese history, and is hence named "Festival of Ages". This is one of the best experiences you can have in Kyoto, with culture and tradition being on full display. The large parade travels from the Imperial Palace to Heian Shrine, which was established to inaugurate the very first Jidai Matsuri in 1895. Every year, about 2000 people participate in the procession. 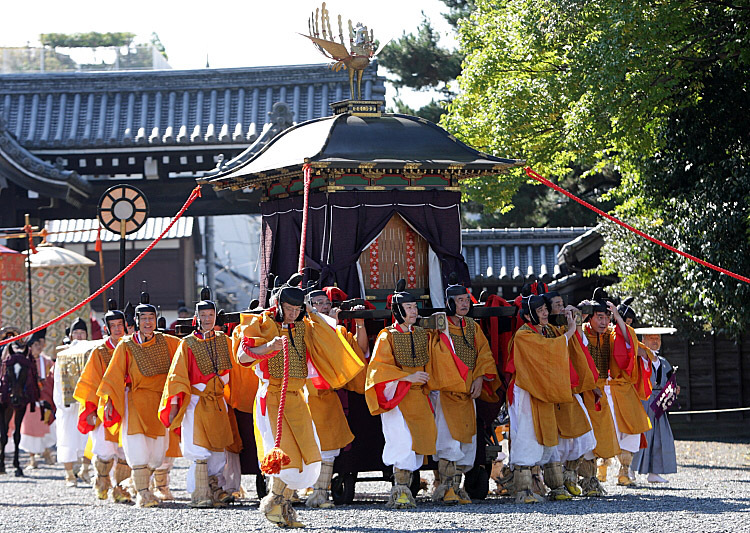 At noon, the procession departs from Kyoto Imperial Palace and parades over a total distance of 4.6 kilometers to Heian Jingu Shrine, arriving there around 2:30 in the afternoon. 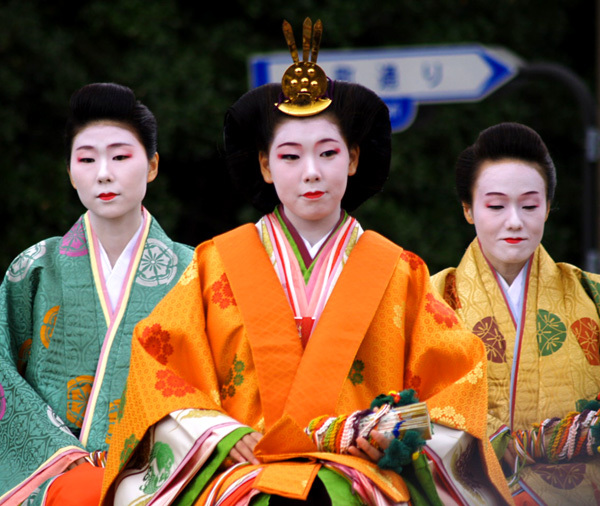 Both the festival and Heian Shrine were established to celebrate Kyoto's long and illustrious history and culture. In 1868, the capital was moved to Tokyo after having been in Kyoto for over a thousand years. Fearing the loss of Kyoto's glory, its city and prefecture governments commemorated the 1100th anniversary of the founding of Kyoto with an extravagant procession that has become a tradition ever since. Despite its relatively short history, the Jidai Matsuri has become one of Kyoto's three most famous festivals, along with the Gion Matsuri in July and the Aoi Matsuri in May. The procession is separated by historical eras and then arranged according to themes, of which there are about twenty. 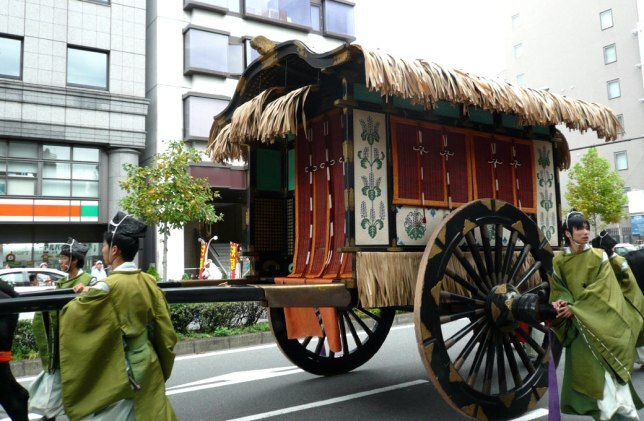 The parade begins with participants dressed in traditional garments from the Meiji Restoration in 1868, and then continues in reverse chronological order until the beginning of the Heian Period in 781. The procession showcases authentic traditional clothing, armour, carriages, weapons and dances. 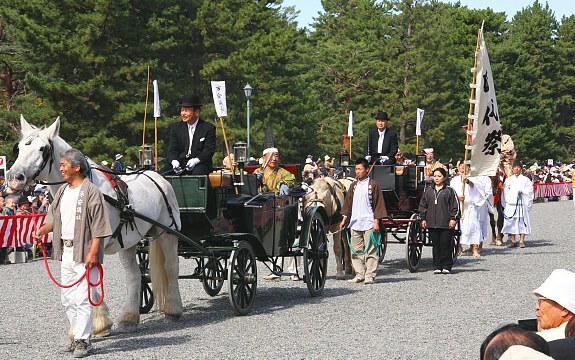 At the very head of the parade there are the festival's honorary commissioners, including the governor of Kyoto Prefecture and the mayor of Kyoto City, riding in horse carriages. Following them are notable figures of the Meiji Restoration, along with a marching band with soldiers who were part of the imperial forces. The costumes are noticeably more modern than those from the procession that follows. 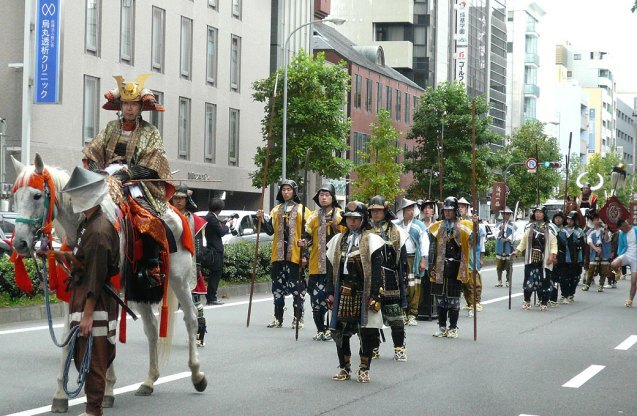 The largest part of the parade depicts the Edo Period. The shogun's convoys make an appearance, depicting imperial ceremonies. The most important officials arrive on horses and palanquin carried by attendants, the way they used to travel during that time. Afterwards there is a group consisting of famous women from the period, including a dolled up princess sitting on a wheeled platform. As the parade continues, spectators are treated to displays of the armour of Oda Nobunaga, a powerful feudal lord and his commanders. The armour is extremely extravagant, and the participants arrive on horseback. They carry traditional weapons such as swords, bows and arrows and show off the military might of the feudal lords of the past. The dress of warriors and common people of the Muromachi Period are some of the most interesting, with participants wearing colourful wigs and costumes and hats with flowers attached at the top. The Furyu odori dancers then perform traditional dances, complete with music from Japanese instruments. 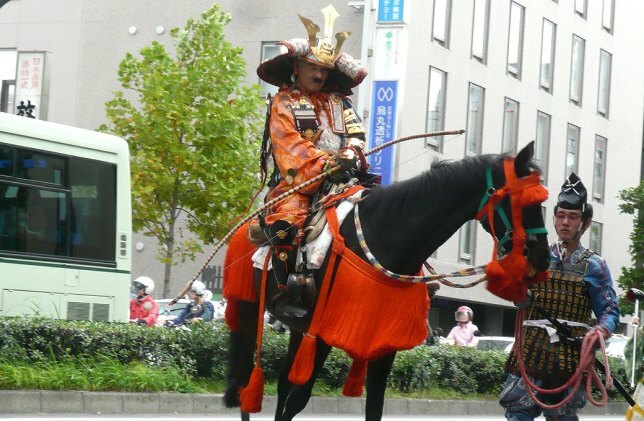 Participants dressed as those from the Kusunoki clan, a clan famous for their warriors , enter with samurai armour and accessories, and those representing the Yabusame carry traditional weapons such as bows and arrows on horseback, with their costumes on. As you can see, even the horses are dressed for the occasion! Famous historical woman also make appearances throughout the procession. 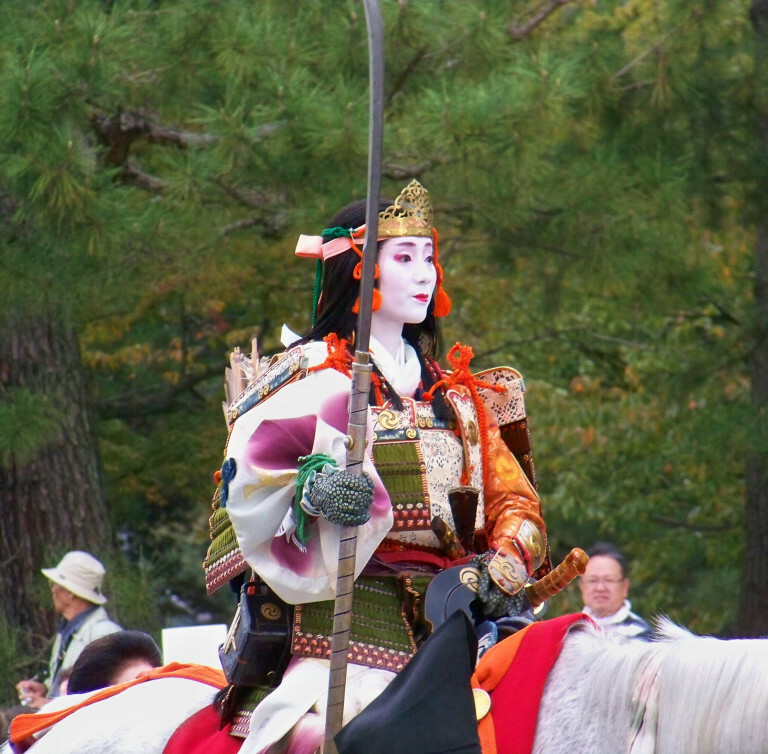 Perhaps the most famous and awesome of these women is lady Tomoe-Gozen, the wife of a Heian period general. She wore male armour and fought beside her husband during the Genpei war against the forces of Yoshitsune, a legendary general. Finally, there are more famous historical women and nobles of the Heian Period. 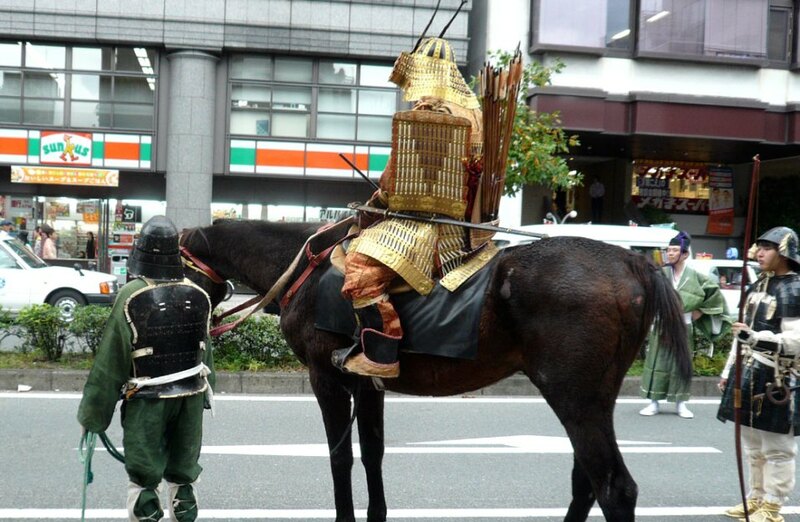 Military armour, royal garments and common traditional clothes are all showcased. Throughout the procession, you can see the transition and changes in the style of the costumes and weaponry corresponding to the eras. The parade also attracts plenty of Geiko enthusiasts. Geiko and Makiko participating adorn the Junihitoe, an elegant and highly complex 12 layer kimono. These are some of the most expensive types of Kimono. Some of the women are carried on platforms, while others walk with a festival participant carrying a parasol following close behind. The very last group of the parade is the most important in terms of Shinto rituals. 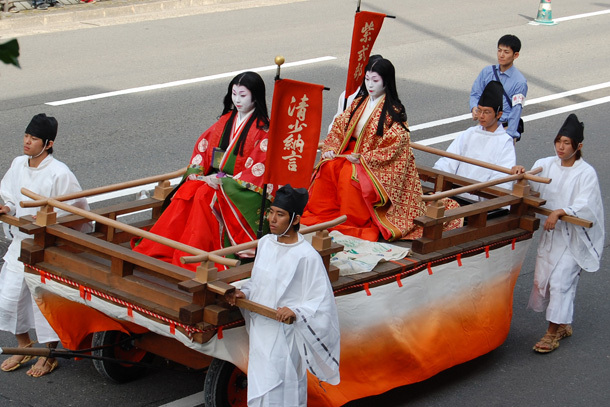 A large number of festival participants carry two mikoshi (portable shrines) that contain the deified spirits of Emperor Kammu and Emperor Komei, who were the first and last emperors to reside in Kyoto respectively. They are paraded to allow people to pay their respects, and finally carried to Heian Shrine, where their spirits have been enshrined. This is where the parade ends. 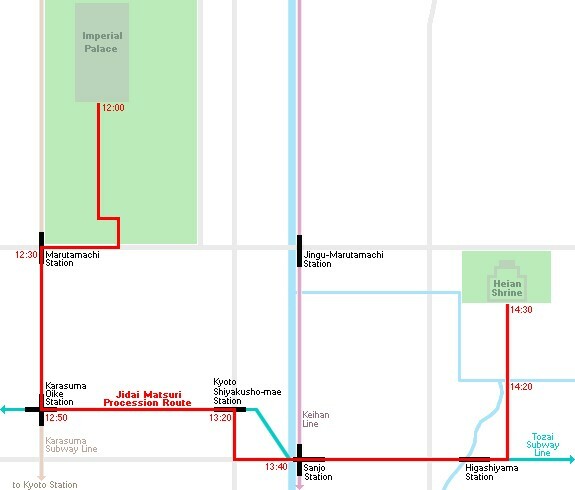 The entire route of the parade stretches about five kilometers. Crowds gather early near the Imperial Palace and Heian Shrine, ready with cameras and snacks. The parade participants usually don't mind photo taking before (Imperial Palace) and after the event (Heian Shrine) as well. Secure your spot early, because about 150,000 watch the parade every year. In addition to the regular viewing areas lining the parade route, there are also sections of reserved (paid) seats at Heian shrine, the Imperial palace and in front of Kyoto City hall. Tickets can be purchased at the Tourist Information Center on the 2nd floor of Kyoto Station, Kansai Tourist Information Center on the 3rd floor of 3F Kyoto Tower Building or JTB travel agencies. It costs 2050 yen each. There are also English audio guides that are available for a slightly higher price (3500 yen). Although reserve seating is available, it is not necessary to enjoy the procession. If you will be in Kyoto on the 22nd of October (23rd if it rains! 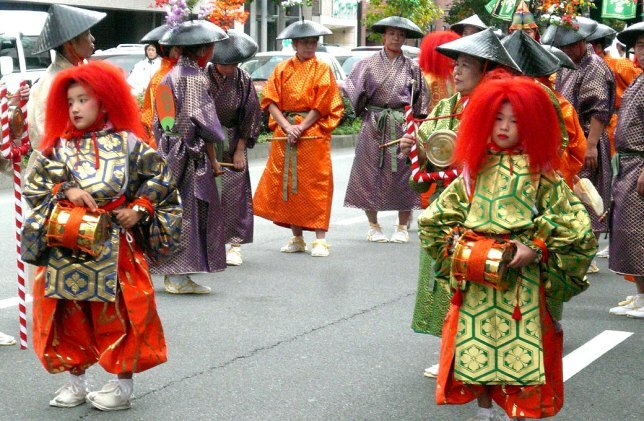 ), don't miss one of Kyoto's best festivals! Why you should visit a temple flea market!